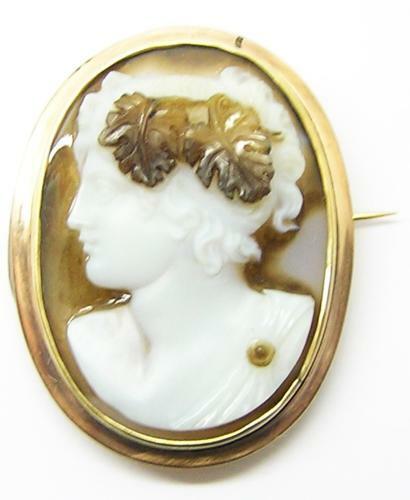 This is fabulous hardstone cameo of Ariadne consort to the god Dionysus, set into an early 19th-century gold brooch. The gem has been beautifully sculpted on a three-layer agate, with great depth and stereoscopic rendering. She has a delicate yet determined face, crowned with vine leaves in her hair. The Gemmarius has managed to utilize the upper brown layer to great effect, both on the leaves and simple disc-brooch pinned to her toga. Such a cameo would have been worn to display one's education and fondness for fine wines and classical art. A prize piece from a Grand Tour. DATE: early 19th century A.D.
PROVENANCE: Ex. private collection, Brighton.